“A Cold Wind Blows” now available on iTunes — Click here to buy! 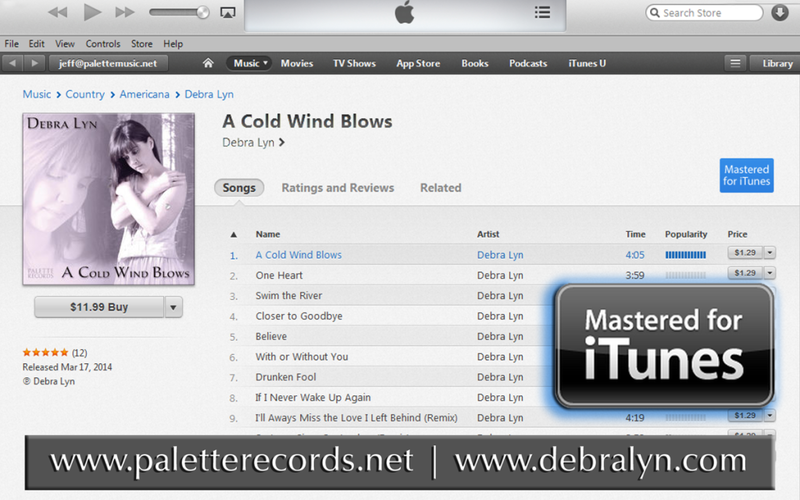 Palette Records is proud to announce that it’s first release by artist Debra Lyn, “A Cold Wind Blows” has been officially badged as “Mastered For iTunes.” We have gone to great lengths to offer this additional iTunes process, which gives you, the listener, the best audio experience available on iTunes. Palette Records has made it our mission to promote art in music and we are extremely pleased to be able to offer Debra’s music in a format that best represents the project both sonically and artistically. Look for the upcoming EP release from Aeone this coming summer.